First time I tried Romeo and Juliet Cheesecake at my Brazilian friend's home. This Brazilian cheesecake is a simple combination of goiaba paste (goiabada) and fresh white cheese. Goiabada is a sweet made from goiaba (guava) fruits. The basic recipe consists of goiabas, sugar and water. You can buy it as a firm paste or soft paste. I had been recommended to try Goiabada Cascao which is a firm paste packed flat in a plastic bag. I need to write a few words about goiaba. You can eat it raw when ripe or made into ice cream, mousse, jellies and concentrated paste, like goiabada. The shape of the fruit is round and the skin can be yellow or green. Here on the picture you can see two diffrent types, one with pink-yellow tone and the other one with white tone. The flavor of goiaba is sweet with slightly acidic tang. In a bowl, combine crushed biscuits and melted butter. Press onto base of baking dish (30 cm*20 cm) and put in the oven for 10 minutes or until lightly brown. Let it cool. In the blender add ricotta cheese, white cheese, cream and condensed milk. Let it mixed well until the consistence is smooth, around 2-3 minutes. Pour boiling water into a bowl, add gelatin and stir briskly until dissolved. Cool slightly and add into ricotta mixture, mix well. Pour over biscuit base and smooth until even. Place into the refrigerator to chill for at least 2 hours. Prepare the topping. In a bowl, place chopped goiabada paste and water. Put into microwave for 3 minutes, take away and mix well. If the paste is still thick you need to put it back into microwave for another 4 minutes. Let it cool slightly and cover the cake. If you do not have microwave you can melt goiabada in a saucepan. 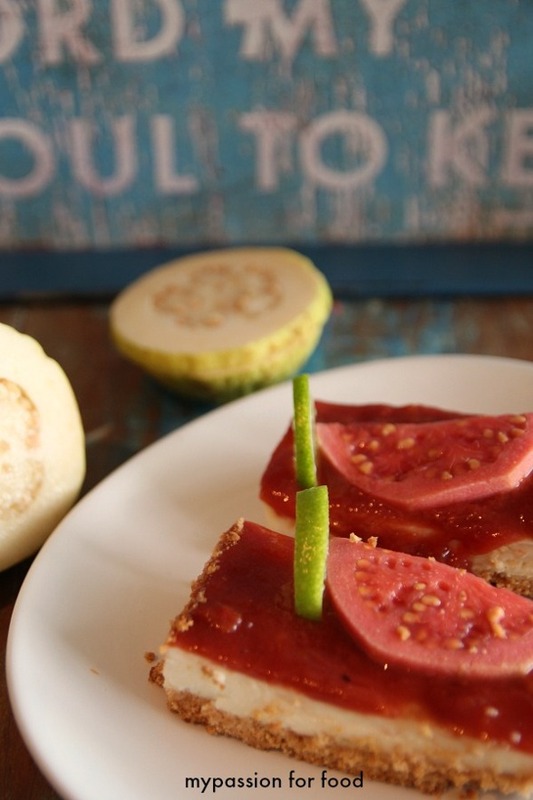 Decorate with some fresh slices of goiaba and serve.